The broken bones can be repaired.But when a heart has broken? Though you repaired it, it will never be the same. It’s like trying to collect and paste fractions of a glass to regain its’ original state. It will not clean and clear anymore. So we must think twice before we spit a word. Thanks for the great quote. I’d rather a broken bone than a broken heart any day …. Sarah Lulu´s last blog post..and a Sunday p.s. Having never broken a bone, I really have nothing to compare it to. I’ve been heartbroken before, and am glad to say that the human spirit is strong enough to heal, and even become stronger than before. Great reminder to watch our words though, Lance, and I think I need this everyday! Although in recent years I’ve come to appreciate that what others think (and say) about me is really about them and not me, it’s something that I still sometimes need to remind myself of. And for most of my life, I had no awareness of that and so my self-esteem was at the mercy of what others said about me. And while each of us is responsible for our own sense of self-worth, it doesn’t excuse our responsibility in how we talk about others. Rightly or wrongly, people will take on board some of our perceived judgements of them, and therefore we do need to be mindful of that. This is a really strong reminder of the power and responsibility of our words. Words are just word, they cannot hurt us unless we allow them to. But words pierce their way into our hearts and souls, leaving wounds. Some of us can heal those wounds over time; others never can. Words can kill a relationship. Words can murder our motivation and inspiration. I have learnt to choose my words very carefully. A great thought of the day Lance. Oh Lance, what a thought! I can relate to this post a LOT! I love the story about a father and son, the father has the son hammer a whole bunch of nails into a board. Then he has the son take all the nails out. He says to his son something like, words are like these nails, you can say your sorry, remove the nail, but the damage from your words, the holes in the board, will always remain! That’s not a direct quote but you get the idea! Words have a special way of uplifting or defeating a person. I cringe at how many times I may have said something to my son that should have been left unsaid! BE Kind, BE Loving, BE Patient, with our words especially! The saying goes, “If you can’t say something nice, don’t say anything at all.” At least that is what I grew up with. This reminds me of a quote I used to say when I was a kid. “Sticks and stones will break my bones, but words can never hurt me.” It’s interesting to think about words and how they affect us. I would like to say that this quote is 100% correct false and the one above is 100% correct, but I don’t think it’s that simple. I do think we have some control over how we perceive and react to words. The words said about us are not our own; they are not a part of us unless we make them so. Of course, this is easier said than done. If someone calls you a name, it’s hard not to let it affect you, but it’s important to know that you really CAN control how you perceive the words (and if you want to perceive them as meaningful at all). It’s not easy, but it’s possible. This is a really interesting quote and it definitely made me think this morning. Thank you! Positively Present´s last blog post..the grass is always greener…or is it? This is heart felt. My heart breaks easily so I work hard on trying to put other people’s words into perspective. Lance, I have never heard that Fulghum quote before but it sure is an important reminder. While we might not care anymore what others say about us, we still need to be mindful of what we say and how it could be perceived. A picture is worth a thousand words isn’t it? It’s hard to believe in yourself if what you hear from others is so painful – all the more reason we need to be vigilant about taking to “heart” the comments of others. It should be easier as adults, but somehow it can pack the same punch. I’m still smiling and cheering inside that a long shot (50-1) won the Kentucky Derby yesterday. Here was a horse and jockey that got absolutely NO press, no attention, no nothing – and he blew away the favorites and all the big money horses. I take great inspiration from that – we can ALL beat the odds if we believe in ourselves whole heartedly and go for it! suzen´s last blog post..Kentucky Derby – Inspiration from a Long Shot! Lance, every human being can choose what to hear and what to ignore. Every word that is heard teaches a person something about the self. How you react offers insight into inner spirit. Another phrase is, “sticks and stones may break my bones but names will never hurt me.” In this sense, a person is always free to decide what to believe as truth and what is only illusion. What people say about you does not determine who and what you are. That never changes. Altho I completely agree with Liara, I think “choosing what to hear and ignore” applies to adults. Children, however, are in such a fragile place and what they are told will be who they think they are. Hi Lance .. that was a shock! I love Suzen’s comment .. “we can all beat the odds if we believe in ourselves and go for it wholeheartedly” .. let’s go do it .. I must go do it .. I will go do it .. Her face is still a shock! Thanks – it’s an image I’ll remember .. and everyone’s made such salient comments .. I just love their wise words and yours in reply ..
Good food for thought. After reading “The Four Agreements” I am better about “words.” I am learning not to take anything personally. Words only have the power you give them. So if someone hurts you with words…you can CHOOSE to internalize it or brush it off. It’s not always easy…but after awhile it becomes second nature. @Vikum – Hi Vikum. Wounds to the heart can last forever. Even if repaired – these wounds can sometimes cut deeply. Our words, what we say, and how we say it – this matters. More than we realize sometimes, I think. @Daphne – You’re right that the human spirit is strong – and can overcome much. I think a lot of this depends upon where we’ve come from – how we were treated in childhood – and if there are lasting effects that make us more fragile to what others say. So, I’m really glad to hear your words Daphne, reminding me and others that we CAN overcome. And I agree. I think it’s also important to realize that everyone does this at different rates, and that’s okay. Thanks much for this thought. @Miruspeg – Hi Peggy. “Words are just words” – how true, and yet, how they are said can make all the difference. And while we have to allow words in to hurt us – hearing hurtful words – these are words that can easily pierce. Thanks much for your thoughts on this Peggy. And thanks for sharing something a bit lighter – and it fits well with the idea of how our words are perceived. @Stacey Shipman – Hi Stacey. I was bouncing around quite a bit on the picture to go with this one, thinking I should use a heart that was broken. And then I stumbled upon this – and knew this was exactly the right picture I was looking for. Labels that fall upon us. And stick, because we start to believe what we here others saying. And yes, I think this is something we start to more fully grasp the older we get. I think most of us have experienced both sides – some to greater degree than others. Especially the receiving end and thinking about this, it’s hard – especially in light of your last line – about if you can’t say something nice, don’t say anything at all. How true. And even if we all did this just a little more, how much we all would be just a bit more secure, a bit higher self-esteem… Thanks much for all you’ve said here – it all rings deeply with me. @Diane C. – Hi Diane. That’s a great point. It is possible to reach a state where we’re not affected by others words, or maybe where we quickly can get beyond them (and that’s a great place to get to, although not necessarily an easy place to get to). Still, that does not give us the right to be hurtful to others – indeed even if we have reached that point where others words don’t matter – I think we’d still not like to hear mean or hurtful things said about us. This is a great point, thanks again. @Suzen – Hi Suzen. Yes, that picture does say a thousand words, and then some. It just seems to fit this quote so well – and really drive home the point of how damaging our words can be. For kids, words hurt and they say something. As adults, we sometimes bottle up those feelings – and that doesn’t mean they’ve gone away – it just means that others don’t know. And thanks for sharing about the winner at the Kentucky Derby – it just goes to show that even with great odds, great things are possible – what a great story! @Liara – Hi Liara. You’re right, of course, that we all have the choice on what we hear and what we ignore. And yes, our inner spirit plays a big part in this. Words do not change who we are. Still, though, not everyone is at that place – a place where words don’t pierce. So, while I fully agree in what you’re saying – about getting to that place where our inner spirit is what matter – about how good this can be – I still think that this is a place many people are not at. And even those well down that road toward this place – still have moments where words hurt. And that’s not to say we can’t overcome – it’s just to say that I think we all need to be aware of our language, and how it can both help and hurt others – depending upon what we say. I still really love the point you’re making about the choices we have, and thank you for sharing your insight. @Caroline – Hi Caroline. Not taking words personally – that’s not an easy place to get to. And even when we begin to get there, at the wrong moment, we can slip back into where words become personal. Choice is such an important thing here – and it’s also such a hard thing when we start to get personal. Getting to where this is second natuer – to not be affected by others words – what a great place to be at. I think about the person whom made that quote famous…..a child comes home crying and tells their parent…a story of the cruelty by words that happened…SO sticks and stones may break my bones and words will never hurt me comes into being……and yet how many sensitive people from children to adults who really are affected anyways….that experience and natural needs of acceptance and also how much more kindness does to make being alive better. Though many experiences show us how little people care about their own insensitive actions towards others. Even those who are working hard not to be “one of those” have a hard time being verbally sensitive at all times. Thank you Lance for sharing this quote. Although many of us I imagine have heard this many times before, in my opinion we are not really letting it sink in. Our words have the potential to be the most powerful weapons or the most uplifting gestures. At every moment we have the choice of whether we are going to build someone up or tear them down. Whether it is between spouses, friends, parents, kids, authority figures, celebrities and the list goes on, I highly encourage all of us to be more conscious of the words we exchange with each other whether directly or indirectly. Sometimes people think it is okay to bad mouth someone behind their back and no harm is done. But what they do not realize is that harm is being actually done to their own heart. May we thus expand our hearts and not harden ours or anyone else’s. Happy Sunday to you Lance! Another great one and the pictures. Oh. My. Goodness. That is amazing. They say it takes at least three positive statements to smooth over a negative one. I think we say things sometimes though, that can never be taken back. Then it becomes up to the person whom has been offended, they have to decide if they will forgive or not, and some do, but it’s so hard to forget. Hi Lance. We are vulnerable to words — spoken and unspoken aren’t we? I wonder what the percentage is regarding our own mental chatter… how much is the inner critic and how much we are supporting ourselves? That was my picture Lance. 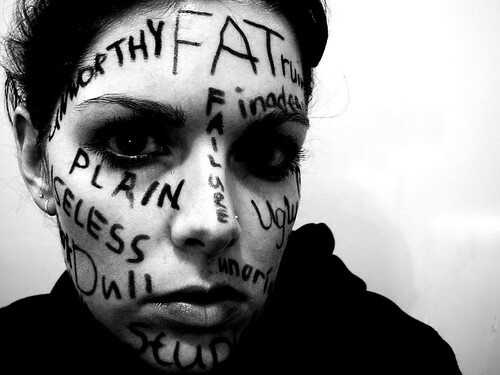 I had all those words and more written and more on my face. I also had “shame”, “guilt”, “unwanted” written on there. I couldn’t imagine what it felt like to feel really chosen and really pretty. Then I was told that I was fearfully and wonderfuly made. I was told I was chosen, loved, and wanted. I was told to let go of the shame and guilt and accept grace and forgiveness. Jesus pulled out a cloth and started wiping those words from my face. I still fight to keep them off but when I think about what Jesus thinks about me, I wonder why I am so bothered about what people think. Is there a human being who can’t relate to this photo? I was totally mocked and put down in school. In a Catholic high school I wore my sisters hand me down uniforms. However I was a tough kid with a sharp tongue and I used it on anyone who wanted to bully me. I feel for the kids who take it all in. I was just talking to two of my daughters at lunch today and we were talking about this very thing. One was a cheerleader in high school (the only non-anorexic one) and she was called a cow. The banners they hung on their lockers were always marked by someone with that word. The there were boys who would “moo-moo” her in the hall. The insane thing is she wasn’t heavy! Not even close. I was a young mom and one Halloween I needed a costume. I thought the cheapest and best thing to do was put on her cheerleading outfit. Now I’m 5″3′ and weight 125 pounds so that tells you something about the size. This is just one example! I’m not saying my kids are perfect but I know for a fact they would never bully anyone. I agree with Jannie…Kids are fragile, it’s hard to shake off. As an adult I am constantly aware of my thoughts, words and actions. I remember the day it dawned on my that “what goes around comes around” does not only mean actions. It means words and thoughts as well. Each one of us is constantly adding love or taking love from the world with our thoughts, words and deeds. I want all of mine to be good. Period! So true. I’ve been hurt so much more by people who I admire, love, or/and been infatuated with. Their heart, brain and tongues were in the wrong frame of mind and it stung for days, weeks, and sometimes years. The older I get the more I realize these people have hated themselves worse than I ever could. It’s this realization that has allowed me to expand my compassion for them. Which has helped me find a way to not let the sting of a mean comment hurt me as much. It features a program that goes into schools to teach children a very valuable lesson about bullying and the power of our words. We live by the golden rule in our house — treat people as you want to be treated and that includes words. It must be ingrained because I am always being told how fair and nice my kids are to others – and NOTHING could make me prouder. Thanks Lance. Perfect quote and picture and wonderful discussion. Knowing what it feels like to have both a broken bone and heart I so agree with this quote. For me, this post brings back the realization that I am the one who has said the most mean and critical things TO myself, ABOUT myself. I’m not quite sure why I have been like that… because all growing up… and even now… other people only say kind and generous things to me. Unfortunately, I have done more damage and broken my own heart because of my self-talk. Thankfully, it is not as bad now as it used to be, but there are still times that I fall back into that trap of not being kind to myself. I think many people do that to themselves… and should stand back and look at how they treat themselves, from an outside point of view. They may be quite surprised at how kind and thoughtful they are to others, yet how mean and degrading they are to themselves. As always, thanks for this post. @Diane – Hi Diane. Oh, that’s a great point – we’re all different. And some of us are more sensitive than others. And that’s not right or wrong, it just is. And to that point, what might bounce off one person may in fact be hurtful to another. And to the idea of acceptance, this is such a wonderful point too, Diane. I think that, deep down, we all want to be accepted at some level. And if we are constantly surrounded by negativity and hurtful words, that feeling of acceptance is going to be very difficult. And yes, how often we forget how our words might affect others, or – how we might feel if those same words were directed toward us. Diane, this comment is full of so much wonderful thought on this subject of our words, thank you deeply for sharing all of this. @Evita – Hi Evita. We hear this and, shake our heads in agreement – then walk away and forget to do this – to really think about how our words might affect those receiving them. Powerful in very good or very bad ways – yes, what we say can cut right through to our heart and soul. Being more conscious – Evita, thank you for this thought – I hadn’t really thought of it that way – yet hearing you say it here – I couldn’t agree more. If we can begin to more consciously think about what we say and how it might be received – we have the ability to spread so much good into our hurting world. And often, this is a silent hurt – hidden behind shields. And by saying “bad things” behind someone’s back – yes, we’re only harming ourselves and our own heart – how true. Evita, thank you for sharing so much here today – truly this has been so good for me to read… And may you have a wonderful Sunday as well, my friend! @Audra – Happy Sunday back at you Audra! This picture just is really such a powerful testament to the words in the quote – and how what is said to us – how that can stay with us. Yes, sometimes what we say – has effects that may never go away completely. Forgiveness does become important then, especially. And forgiveness for harsh words isn’t always an easy thing. Especially if these words strike us deeply – the pain can be difficult to overcome. @Davina – Hi Davina. Ah, spoken AND unspoken – so true. Some are words we say to ourself – or words we think other “think” about us – and they start to become real in our minds and then our hearts. Painfully real. That’s a great point – that sometimes we can be the ones feeding ourselves hurtful words, and bringing ourselves down in the process. @Laurie – Hi Laurie. We’ve probably all had some combination of those words written on our face (and in our hearts). The more that are there – the more difficult it is. Even if it’s only one person saying these words to us – we can sometimes let that become the reality we believe. Words can hurt. Deeply hurt. You ARE wonderfully made – just as each and every one of us is! And seeing that, experiencing that – how wonderful, isn’t it Laurie! And that doesn’t mean words still sneak back in sometimes – they do. However, if we can continue to remember this real belief that we are all unique and wonderful – what a great place to strive to be at. And that you have a Savior in your life – one that loves you very much, in fact, more than is humanly possible – that right there is proof enough that you are wonderful just the way you are. And thank you for the thought on whose opinion really matters anyway (easy to say…not quite as easy to put into action). Maybe it’s a journey for all of us to work toward this point… Laurie, thank you so much for sharing so personally what this means to you. @Tess – I happen to agree with you, that at some time in our lives – we have all experienced this photo at some level. Thanks so much for sharing some of your stories, and the stories of your children – concrete examples as to just what damage words can do. School can be a difficult place, as we’re trying to fit in, and to find our place. And then when we’re ridiculed – this can be so difficult to take and not let affect us. And does some of this roll over to adulthood? Sure, I think it certainly can. Kids are fragile – even those who have a tough exterior in high school. And it can take a long time to overcome that, especially if we received this treatment not only in school, but also within our home. “Adding love or taking love from the world” – I find this statement to be so powerfully true, thank you for sharing it – and everything else you’ve shared here today. Your words are here to help others, to help me – in seeing just how powerfully damaging or affirming our words can be – and why it’s so important to chose what we say carefully. @Jenny Mannion – Hi Jenny. I just stopped over to check out your post – how true to the conversation going on here today, and what a great piece you’ve written on this. Thank you for sharing it here. The video is especially very moving as to just how much of an effect our words have. Living by and teaching the golden rule – is something everyone should be doing. And that you are, and because of this, you know that your children (and you and your husband for that matter) live this. You should be proud – this is not only something nice your children are doing. It is also something they are passing on to others. Others will pick up on what they’re doing – and if it makes one other person be more “golden rule” like – what a gift they’ve passed on because of what you’ve taught them. Thanks again Jenny, for this, and for all you’ve shared in the link – so much great stuff here today. Which always makes me think… since boys often use physical violence while girls prefer emotional violence, are girls causing each other more long term harm than boys do?? So true! Words can have a far greater impact than we realise both in a positve or negative way. It reminds me of a story I read once where a father was teaching his son about this very concept. He had him hammer a nail into a fence whenever he said something unkind. He then said to his son that everytime he says sorry to the person he was unkind to, he was to remove the nail. After a while the father had the son inspect the fence. He explained to his son that even though he’d said sorry each time and removed the nails, the fence was still left with holes, much the same way a person is left after something unkind has been said to them. A powerful story. Kids and adults can be so cruel with words, not thinking about how those words might affect the other person. I know growing up, I was always the tall kid (I’m 5’10”), and with a name like Newton, I got a fair amount of teasing. And it hurt. My comment probably is a bit late. First of all, I love the picture. Secondly the quote is very true. Words can have positive and/or negative impact. I have experienced hurts just because words. Luckily, I managed to get by. @Vered – Hi Vered. Hmm…interesting thought. While I think that both can cause either, you are probably correct that males are more likely to resort to physical violence. Does that mean they do less emotional violence? There’s a lot to think about here Vered. In the end, we can all improve from where we’re at today – and that’s something worth doing no matter where we are on the emotional violence continuum. @Sami – Hi Sami. That’s a great story to drive home this point. Nails being like hurtful words driven into our hearts. Even when they’re removed, they still leave an impression. Much like words that hurt us – even when they are taken back – we remember. Thanks much for sharing that. It fits so well here today. @LisaNewton – Hi Lisa. Without thinking – that’s it. We don’t alway think about what the impact of our words might be. Being a teenager is not easy – it’s very much a time when teasing takes place – and it can and does hurt. The thing is, some of this continues even in adult life, and that doesn’t make it any easier. @Suddenly Slimmer – Hi Alia. The picture speaks a thousand words doesn’t it – more than the words we see on her face. It is so telling of what we can feel when others are hurtful to us. And know that just because you managed to get through hurtful words, that doesn’t make it right…. Wow – that picture is SO POWERFUL! And so true – words can be so hurtful. A great reminder to really think about what we say. Haven’t been by in awhile but I am glad to be getting back here! Yes, words are like swords, whether dull or sharp, they cut just the same! This is a prime example of the power of words. With the stroke of a pen, or the tap of the keys, we can either lift someone up or bring them down. It is our choice, but it’s “their” heart we’re touching. I pray we all do the right thing. Thanks for sharing, Lance, it’s really touching. Noe´s last blog post..Suburbia, I Love You! @Mark/ToBeMe – Yes, the image here really is so powerful, especially with this quote, it stand out. @Henie – Hi Henie. It’s always good to have you here. Words like swords, great comparison – they have the ability to pierce, to hurt, and to leave a wound. Why Should You Use Catering Service for Your Next Event?